The FS222B PSTN/GSM 3G Alarm Console with SIM5320 module dialer digital/voice/SMS report offers Four-Bands 850/900/1800/1900 system. It is approved by R&TTE and GCF. The transceiver module board can combine with Fronti wireless accessories, like keypad/sensors/siren. It is a simple and easy operation on full SMS operation and setting function. It can option Wi-Fi module for combine with smart phone FS330A APP. LED indicators for Power On/Off, TEL, TEL on-line and system fault. 10pcs remote controller and 70pcs sensors, they can be set to have different alarm functions of 24H, bypass, delay, door chime and silence. It can control the FS148S wireless external siren and the report event to FS310W wireless keypad LCD. 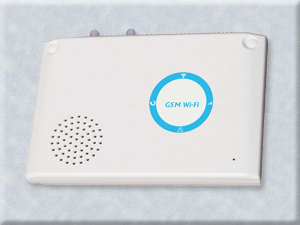 It can combine with wireless keypad, so that it can two-way communicate for setting console program, working mode and can display alarm event. Power Source 12-16V DC 1.5A by AC adapter.